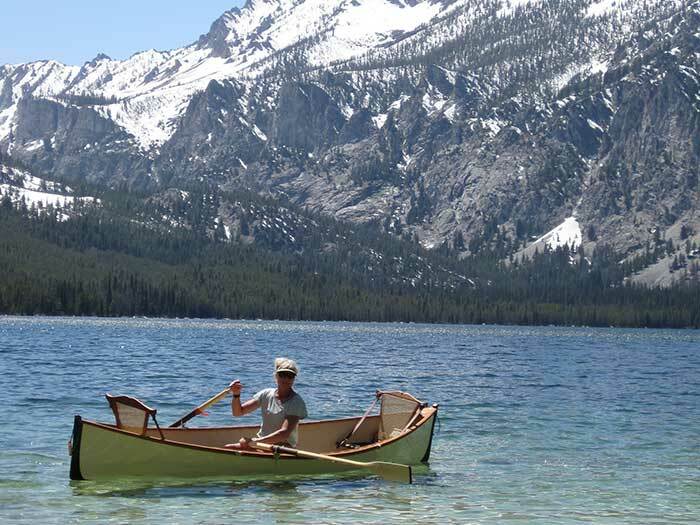 Our Vermont Dory is now the most popular boat we build. It is a beautifully-shaped Kevlar composite boat known for its outstanding versatile design providing both an excellent rowing boat and an excellent sailing boat. It is the boat of choice for camp cruising, fishing, and long distance open water rowing. Our unique design marries a sharp waterline with a wide flat keel, symmetrically concaved bilges and a hard chine. The result is a very stable boat with a huge 700-pound capacity. Yet you also have a responsive, fast, seaworthy boat that is very easy to row. We met a charming young woman at the Wooden Boat Show at Mystic Seaport. She is a student at the University of Vermont, a sailing instructor on Malletts Bay and an all-around water-person. This short YouTube clip shows Mia rowing our Vermont Fishing Dory. Mia had never rowed much of anything. This video was taken with perhaps five minutes experience in our boat. One of the things we particularly like about this small clip is…..it shows the relation between the boat and the water. Experienced boat-folk can see a lot in how the Vermont Fishing Dory boat moves. The boat hull is built with a Kevlar composite and trimmed with select cherry wood. The Vermont Dory includes three cherry seats with black nylon webbing, two maple oars, two cherry caned backrests with adjustable leather straps that move between all positions, three sets of oarlocks, one cherry footrest, Okume floor boards and two Kevlar skid plates.